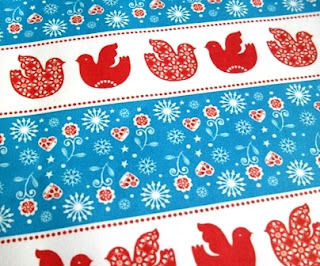 Hello and welcome to another Handmade Monday - if you're new here, this page explains what it's all about and how to join in. 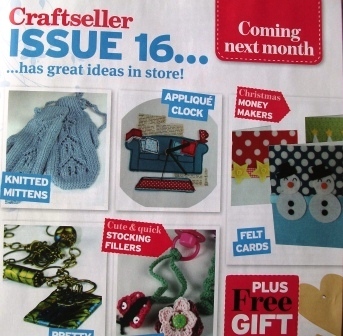 You may have seen this post about my blogging article in this month's Craftseller magazine. What I didn't notice on first reading the magazine is that my sofa clock is on the "coming next month" page! Yay! This week, I was also asked to do a very last-minute project for the same magazine (for next month's issue, in fact). 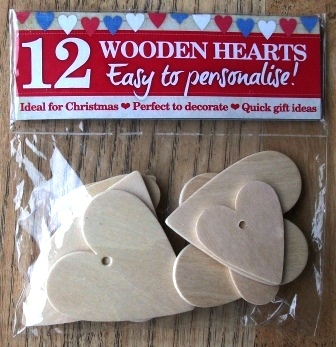 On Thursday, they sent me a set of the free wooden hearts they're giving away next month, and wanted them back (transformed into bunting) by Monday. Or Tuesday, if I could post them direct to the address the photo shoot was taking place. Good, I thought, Tuesday means I can post them Monday and have all weekend to play around with them...Ha! I faffed for a while as they wouldn't print out at the right size, not even knowing at this stage if my plan for decoupaging the designs onto the hearts would work - inkjet printed papers can smudge badly when wet. So, we'd already planned a day out on the Friday. I thought I had plenty of time - all weekend! - and then halfway down the M56 I shouted Heck! (OK, possibly it was some other four-letter word to that effect!) - I had suddenly realised Monday was a bank holiday and this project had to be posted by about 11am on Saturday if it was going to reach the magazine on time! I spent Friday evening gluing the images on and stringing the hearts together. Miraculously, it worked - I had printed onto card, didn't water the PVA down, and the ink didn't smudge, although the glue did go pink so there was a bit of loose ink somewhere. This part was much quicker than I'd envisaged, so it all worked ok. It's fortunate they didn't need images of the steps on this one, as evening working and artificial light doesn't make for good photos. I do like a challenge, though, and love it when it all comes together! I thought the finished bunting looked quite nice - red, white and pale blue is one of my favourite colour combos. Right now though, it's Handmade Monday and I'm looking forward to seeing what everyone else has been doing. Join me and have a good look around everyone's blogs. Well done Wendy. The hearts are really lovely. I remember writing the card-making article for Popular Crafts meant I had to take it all on holiday for me, so no pressure. Just spent every day worrying that the apartment's broadband allowance might run out and prevent me emailing the pics and text through. Hope you have a good week. I admire your ability to stay calm enough to have a day out. I think I'd have had problems being creative with such a short deadline and have been considering hand delivery/couriers etc! Good thing you remembered about the bak holiday posting. I keep forgetting when these days crop up. The clock and bunting both look great. Great that the printer ink didn't run- that's always a nightmare! What a great clock. I would have gone into meltdown with the heart project. You've done a good job with them. That's the kind of thing I'd do, forget about the Bank Holiday. So glad you got it sorted and the bunting looks great. Hope it was okay to add the link to my big list of online yarn shops rather than to a knitsofacto make ... I thought it might be really useful to some of the other Handmade Monday'ers. You did a great job! Wondering if sometimes being under pressure can really bring out your creativity. The papers look beautiful - must reserve a copy of the mag to see you! The heart bunting is fab. Hope you still managed to enjoy your day out too! I love that bunting. You did a great job. I am heart obsessed so may have to give that a try. So glad that turned out so well, and it did! I do think that experienced crafters and artisans can usually make things work out even in a short time. :) It's really beautiful. Seems we both had hearts in our minds. Glad you are having such wide exposure these days! Oh Wendy, you are teasing me with this Scandinavian stuff! I dribble whenever I see some red-n-white creations! 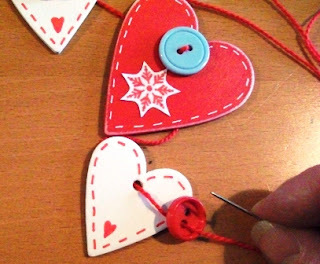 your heart bunting looks great and you did very well with your task. also congratulations on your projects being published in craftseller. which issue of the craft seller are these scandinavian papers available? let me know please, i might have a wander round the shops very soon. Congrats on your Craftseller front page and continued craft consults. Your work is gorgeous. Martha, to be fair on them, they did know they were asking a lot of me and they ask if I was up for a short-notice project. They usually give me a lot more time! The Scandinavian papers will be in next month's mag - out on 25th September. I was thinking about you while I was doing the hearts!! i remember that last year there was a card making pack with scandinavian papers and obviously i had to buy it! wait till i show my scandinavian papers i bought at hobby craft today! :) woohoo! im sooo glad the producers are meeting the crafters' needs and make stuff in Scandi style! Hi there. I really enjoyed your obvious crafty rush at wanting to deliver your best. They look adorable. I am at present reading Craftseller about "blogging" , so this is why i have taken the plunge to have a look at how it's done. I will now be waiting for your next installment. You're even busier than when I signed off for the summer, back in June. I hope you've had some lovely times, even if the weather has been unpredictable. The bunting was delightful and inspiring. Helen - yes, they certainly do! Paula - welcome! hope to see you blogging before too long! Adaliza - that word busy seems to be on my lips a lot at the moment! Yes, the summer weather is disappointing but we can enjoy ourselves regardless!